"The Living Daylights" was written as the theme song to the identically titled James Bond film. The 7"-release features three individual colour-shots of the band members (Morten, Pål & Mags) by Paul Rider in the upper right corner on a bluish background. A black a-ha-logo in the shape of a gun is placed in the mid left position, while the title is written in white capital letters in the lower right corner. In addition three and a half small red "bullet holes" have been placed close to the gun. The reverse offers three small colour shots from the movie on the same bluish background, while the track listing has been printed in red capital letters on black strips near the upper right corner. In addition there are four more of the red "bullet holes". The regular 7" release offers the single version of "The Living Daylights" (4:04), written and produced by John Barry and Pål with additional production by Jason Corsaro and Mags, plus the "Instrumental Version" (4:40) on the flip. In addition a limited edition fold-out copy was offered to fans. While the reverse side of the picture sleeve is identical to the regular release except that the background colour is silver rather than blue, the front is all silver. 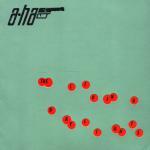 There is an a-ha gun logo in the upper left corner, while several holes have been punched through the sleeve in order to reveal the title printed in black capital letters on a red background. Opening the fold-out sleeve, the three individual coloured shots have been placed on a black background in the upper left hand corner. A grey enlarged a-ha gun logo covers most of the space and the title has been printed with black capital letters on a background consisting of red drops of blood. As with many of the 7" singles, there are versions available with different coloured labels including white, silver and red. The 12"-release presents the additional track "Extended Mix" (6:59) produced by Corsaro, Barry, Mags and Pål, but is otherwise similar to the 7" concerning the sleeve. There is also a 12" limited edition 12" picture disc available. 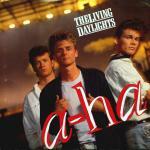 This features a colour band-shot on a bluish background with the same a-ha logo and titles as the regular releases. The reverse has a picture of a truck flying through the air which also functions as a background. In addition there are the same two small colour shots of the main male and female characters of the movie featured on the reverse of the 7" and 12"-releases placed in the lower left quarter of the record. The a-ha gun logo is light blue, while the track listing has been printed in red capital letters on black strips. 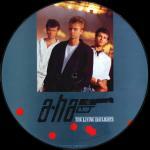 Argentina: There was an Argentinian promo 7" with a-ha's "The Living Daylights" (Su nombre es peligro) on side A and The Pretenders "If There Was A Man" on side B. The single comes in a company sleeve and comes promo stamped. Australia: The 7"-release has the same sleeve as the USA 7" (see below). Brazil: The 12" promotional release "Maracado Para Morte 007" comes in a unique picture sleeve. One side of the sleeve is black with a picture of the band (Mags, Morten and Pål) standing in front of a Bond picture on the right hand side. On the left hand side, the A-HA logo is printed in white letters at the top with the title in red at the bottom. The other side of the sleeve features a picture of Madonna. 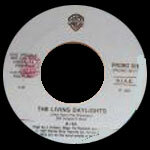 Canada: The 7" promo has "The Living Daylights" on both sides of the disc and it comes in a WEA sleeve. Greece: There exists a rare white label Greek Test Pressing 12" of "The Living Daylights". It doesn't come with a picture sleeve and has a plain white label with faint print on the second side. Italy: There is also a Warner juke box promo 7" with b-side Bob Seger - "Shakedown", it doesn't have a picture sleeve. As with most juke-box releases, the disc has a large cut-out hole in the centre. Japan: The Japanese 7" picture-sheet is in many respects the opposite of the U.S. edition. The front is identical to the reverse of the American sleeve, while the photo on the front of the U.S. edition has been reduced in size and placed in the left corner. "a-ha" is written in large capital letters in the upper right hand corner, while the yellow capital lettered song-title is written across the mid section of the sleeve. The reverse of the Japanese picture sheet contains a small black and white group-shot, lyrics in Japanese and English plus a small advert for "Scoundrel Club". The time on the a-side of the 7" is listed as "4:15" but is the same version as on the UK 7". Mexico: The 7" promo does not come in a picture sleeve, it has the 7" version of "The Living Daylights" on both sides of the disc. Portugal: The 7"-release has sleeve similar to the UK 7" except that the back is printed in black and white. South Africa: The South African 7" comes in a blue and red WEA / Warner record sleeve. It is manufactured and distributed by TUSK COMPANY (PTY.) LTD.
USA: The 7"-release features a totally different picture sleeve compared to its European counterparts. A multicoloured band-shot from the same photo session as the one featured on the front of the 12" UK picture disc covers the whole sleeve. Titles in red plus a white a-ha-logo is placed in the lower right corner, while the underlined single-title is written in white capital letters to the upper right. The reverse features a drawing of a blond woman in a white dress holding a gun plus a tuxedo-dressed Timothy Dalton aiming his gun at her. The underlined red and white song-title plus the additional information in light blue colour are placed in the upper right corner. This release contains the same tracks as the regular UK edition, while the promotion record has the 7" version (4:05) on both sides. Some of these promos come in a regular U.S.-sleeve, while others come in plain WB-company sleeves. Philippines The Living Daylights / (Instrumental)? 77585 ? 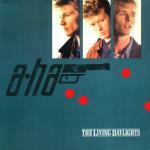 Portugal The Living Daylights / (Instrumental) 1591797? 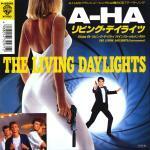 Spain The Living Daylights (Extended Mix) // (7" Ver.) / (Instrumental) 920 736-0 ?